Much in life is either attributed to science or art. Making great whisky is often an interplay between the two. At least, that is the case of Glenmorangie Pride 1981, the company’s new limited release that combines know-how and serendipity to create an exceptional spirit that seems destined to be enshrined as one of the great single malts of our age. The 1,000 bottles of Pride 1981 come from an exceptional distillation of that year that was further enhanced by a finishing process developed comparatively recently in the annals of whisky-making. The result is something that is assuredly greater than the sum of the two. Dr. Bill Lumsden, Glenmorangie’s master distiller and head of whisky creation, recalls the creation thusly: upon taking his current position at the distillery in 1998 he “set out to gain a better understanding of the stocks on hand.” In the Highland’s Glenmorangie whisky of the 1981 whisky, he found an exceptional level of consistency, one that wasn’t shared with those at Ardbeg, the parent company’s other Scotch whisky distillery, far away in Islay. Despite being the owner of a doctorate in biochemistry who developed the ground-breaking technique of “finishing” whiskies to enhance their flavor, Lumsden admits that the quality of the 1981 whisky came about for “reasons we still haven’t been able to figure out.” A year later, more good fortune came when he was able to procure a small number of Sauternes barriques (aging casks that had been previously used to the legendary Château d’Yquem wine). The distiller decided to put the two together by finishing the Bourbon-barrel-aged whisky in the wine casks for further flavoring. In Glenmorangie’s Warehouse No. 3, he further matured the by-then 18-year-old whisky for another 10 years. Even though he had been the developer of this additional and alternative aging process, his attempts with the Sauternes casks weren’t immediately successful: “In the first couple of years, it didn’t seem like anything was going on,” he says. Patience willed out and after another 10 years—28 years, 9 months and 11 days in total—Glenmorangie Pride 1981 was born. The exact birth date of the whisky was the result of careful monitoring of the casks for flavor. Eventually, the samplings came as frequently as every three months in the last years before it was bottled. “Everything is all about the taste,” Lumsden says. “Age is only one part of the story. I’m sure the marketing people would have preferred I waited until it was 30 years old, but we pulled it in 2009.” As it is, the whisky is the oldest currently offered by Glenmorangie. 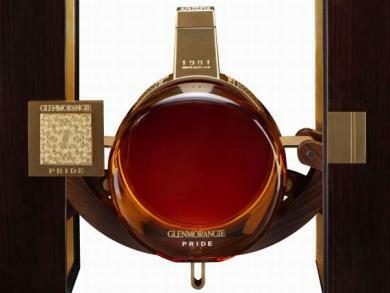 Today, the Pride is bottled at the cask strength of 56.7 percent alcohol (113.4 proof) in a specially designed package and decanter for about $3,600 (assuming you can procure it). Lumsden says he kept the alcohol level intact rather than dilute it, as whiskies typically are, because older malts don’t react particularly well to water. However, part of the packaging is an eye-dropper full of Glenmorangie’s Tarlogie spring water in case you disagree and want to dilute it in gentle increments. The presentation is also very impressive. As Lumsden has explained: “We realized that the packaging had to be very special too. Very luxurious, very beautiful and very different, something with two sides: one to reflect the character of an extraordinary whisky, the other to celebrate the heritage of Château d’Yquem.” To do that, Glenmorangie commissioned two designers-one for the case and one for the decanter. Wouter Scheublin, a young Dutch wood craftsman, built an oak box that slides apart while lifting the bottle towards you. Laurence Brabant, a French designer, created the bottle with Baccarat that’s a round vessel with glass on the front and back and a circle of wood sandwiched in between. While the whisky is clearly exceptional, we haven’t yet paired it with cigars, which we hope to do when the good doctor next visits New York City. Stay tuned. APPEARANCE: Rich amber, almost copper color. Sultry, slow legs. NOSE: The wine casks are immediately identifiable on the nose, joined with spices, maple syrup, hazel nuts, marshmallow and slight spice. PALATE: Starts out silky soft in the mouth and fairly closely explodes spice and sweetness of licorice and lemon, becoming—like Sauternes—a liquid dessert. Clove, nutmeg, olive oil, sour dough and eucalyptus all pile on. FINISH: The mouth flavors linger for a seeming eternity, bringing with them peat and smacks of rich sherbet. A few drops of water bring out oakiness.